Bend is one of my favorite cities to visit. It has the high desert weather, some amazing wilderness, amazing beers, and a pretty decent vegan scene to boot. Also, Cline Butte OHV area has some nice options for wheeling. Only thing is, you need to know where to go. Hopefully this guide will help for your next trip. I have heard rumors that Chow is the place for vegan options in Bend, but man I could never get a table (unless you either camp out the night before or are willing to wait an hour). This is still on my short list for my next visit. UPDATE 4/10/2017!! We made it to CHOW. The server was really excited to tell me about their vegan options (even telling me he’s giving it a shot after reading the China Study). I ended up with the GF/Vegan pancakes which were not bad (but dry/crumbly). They will sub tofu for any eggs (scramble or like on a Benedict). They seemed knowledgeable about hollandaise and vegan ingredients in general. The wait was about 40 mins on a Sunday, but we sat in the covered greenhouse bar and had coffee and drinks. 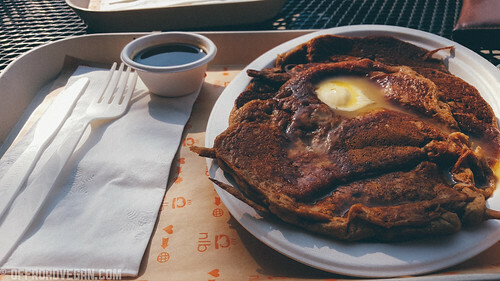 If all you want are pancakes, Next Level has them beat. But if with Omni friends, its a great spot. However, with the addition of Next Level Burger and their amazing breakfast options, I would be pressed to say that these guys have the best vegan breakfast in Bend. It is more traditional, too (i.e. pancakes) which makes it even better. NOTE: It seems like they open on weekends at 10:00 for breakfast so plan accordingly. 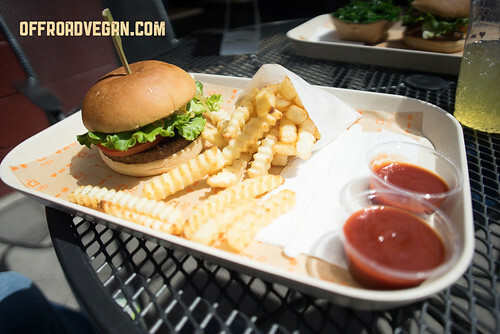 Vegan breakfast nirvana at Next Level Burger. For lighter options, I strongly suggest you visit Rockin’ Dave’s, an AMAZING bagel shop! You will need to also be prepared for crowds on a brunch day, but you can also grab a great bagel with Tofutti, a juice, and hit the road. I got their vegan burrito and it was stuffed with seasonal veggies, rice, and potato mash. Super good. I was really impressed they had an entire vegan menu. Big O, another bagel shop had some delicious bagels and Tofutti spreads. The crowds here were a lot lower than Rockin’ Dave’s, and they have more locations around town. 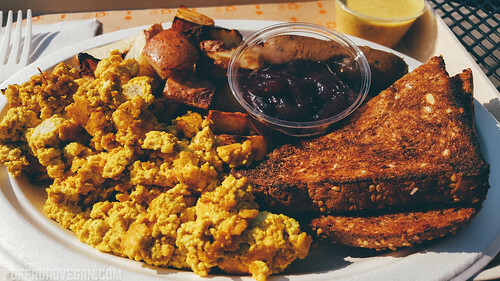 Most vegan places that serve breakfast also serve lunch. There are two key contenders in my opinion for a solid vegan lunch. Next Level Burger obviously has some amazing burgers, but they also have grilled cheese sandwiches, and a host of other options like salads. The milkshakes are the bomb, and you can choose what non-dairy milk you want for your shake. A healthy, delicious, burgery lunch at NLB. My second favorite place for lunch is Broken Top Bottle Shop. The nice thing here is that they offer amazing vegan options but still have a selection for my meat eating friends. Their beer selection is second to none, especially since you can pick from their insanely huge cooler, and enjoy anything at your table. Outdoor seating is sunny, a great way to soak up some Bend sunshine. An amazing sandwich at Broken Top. 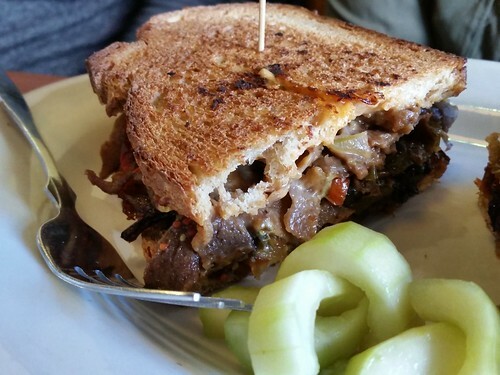 My favorites are the BBQ tempeh sandwich (with brussels, above) and the Seitan Reuben sandwich. 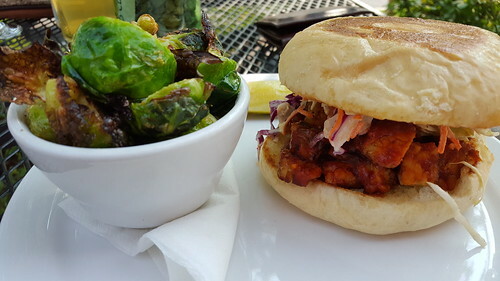 Bend has a growing vegan scene, so I will keep updating this post (especially with some dinner options) as we continue visiting Bend and trying more places! Crux Fermentation Project used to have a pretty respectable vegan scene, but sadly it has become pretty weak (remember the buffalo cauli with that porter peanut sauce!! GONE). I ended up with a Vegan Caesar salad which was a $12 bowl of romaine and overall blandness. I wanted something hearty after a few of their IPAs and sadly I was unable to find a good option. Still love them for the beers, but vegans should pregame for sure. Bend Pizza Kitchen is THE JAM!!! We found them via Google and I am sooo glad we did. They have a dedicated vegan menu! I was torn between the Pesto Pollo and the BBQ Chicken. I ended up with the BBQ chicken and it was really good. They use Beyond Meat’s chicken strips and Follow Your Heart cheese (I honestly prefer Daiya, but whatever). Beggars cannot be choosers. The space was really clean and nice. Be sure to give them a try! They also deliver, but only West of the river. Hey, next time you’re in Bend you should come by Salud Live Kitchen and juice bar. We are a raw/vegan cafe serving breakfast and lunch and we are 100% organic! You should definitely try A Broken Angel Wednesday through Sunday. By far one of the best places for 100% vegan & organic Lunch. Awesome! Will do for sure. Are they new?